There are plenty of opportunities to land a Medical Office Administrative Assistant job position, but it won’t just be handed to you. 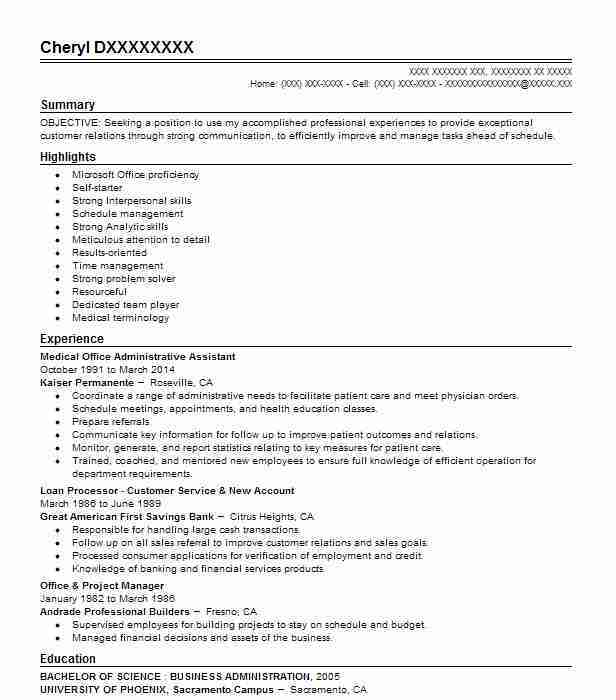 Crafting a Medical Office Administrative Assistant resume that catches the attention of hiring managers is paramount to getting the job, and LiveCareer is here to help you stand out from the competition. 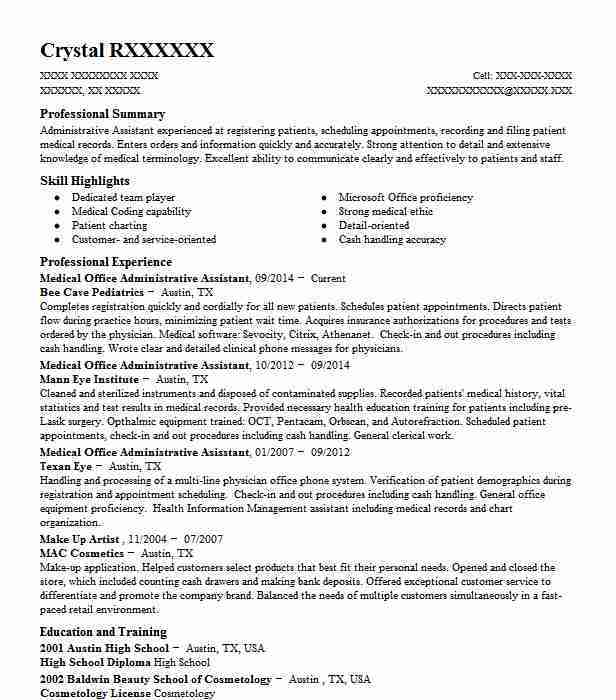 Medical Administrative Assistant with extensive hands-on experience in providing administrative support to complex medical groups and health clinics. 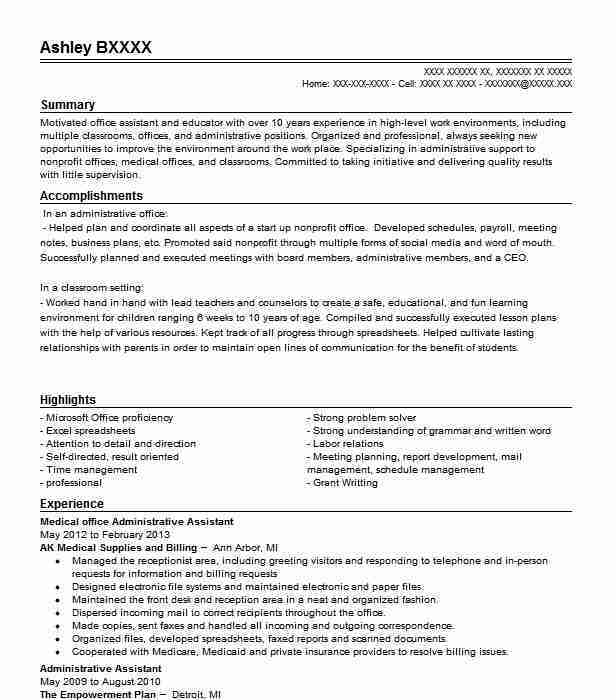 Skilled in managing front office functions, including customer service, patient appointments, billing and collections, and records management. Success in optimizing delivery of care by automating charting systems and continuously measuring performance metrics. Seeking to take next career step in health administration with a respected organization dedicated to providing high-level care to diverse patient populations. Partner with practice managers to devise and monitor metrics and related tools to evaluate and improve health delivery systems. Utilize population-based health principles to create healthy people, communities, and fit-and-ready force. Conduct monthly chart audits for family practice, primary care, pediatrics, and internal medicine. Collaborate with subject matter experts to create and implement preventative initiatives; developed and initiated preventative disease management plans for cervical cancer and colon cancer-eligible populations. Leverage strategic alliances to perform patient data pulls and disseminate information. Generate detailed reports focusing on patient outcomes to facilitate decision-making and influence process improvement, program development, and long-range planning. Managed all front office activities to optimize facility workflows and patient management and provide comprehensive administrative support clinical and office manager, including appointment management, billing and collections, office administration, and customer service. Addressed and responded to incoming/outgoing calls and correspondence. Created and maintained confidential patient files; implemented EHR systems to automate patient records management. Trained new and existing staff on new computer systems and facilitated communication between clinic and system support specialists. Collected, processed, and compiled annual service plan notices to clients within 14 days of annual meeting; processed 2,000+ client plans annually while performing routine plan updates. Actualized change management strategies to streamline merger between Carlsbad Mental Health Authority and Carlsbad Regional Center in 2006. 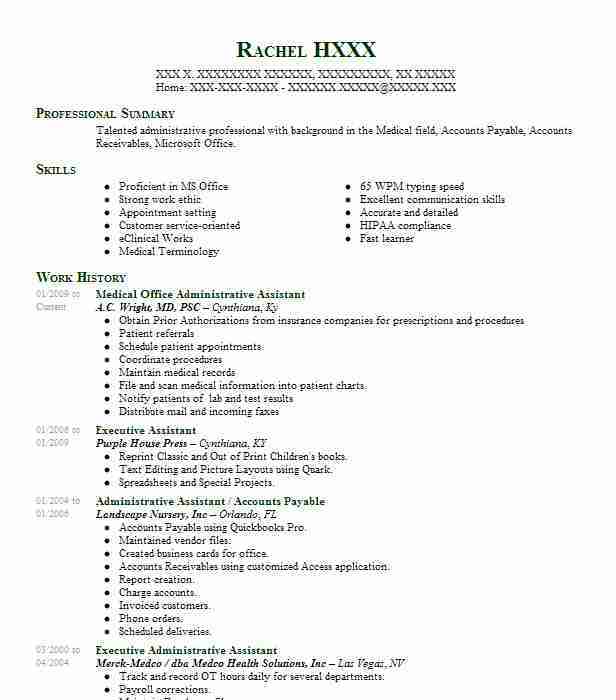 Medical Office Administrative Assistant dedicated to keeping office administration running smoothly. Experienced with electronic health care software as well as scheduling and appointment setting. Served as receptionists of medical facility by greeting customers as they enter setting them up appointments and directing them when it’s their turn for treatment. Coordinate appointments with doctor and patients schedules and make any modifications such as cancelations or date changes necessary. Create and update patients’ electronic health records and verify their insurance before submitting any insurance claims to providers. Assisted University medical staff with diagnosing and treating patients. Helped fill prescriptions by counting out pills and performing clerical duties to check out patients. 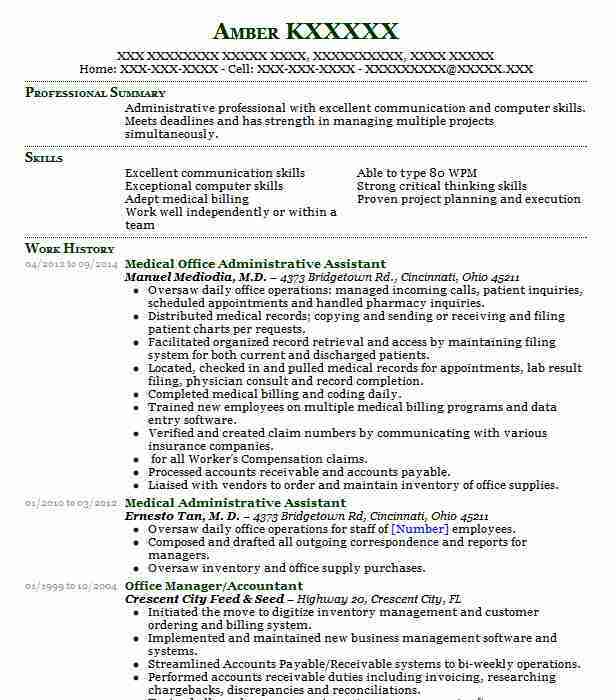 Medical Office Administrative Assistant @ Manuel Mediodia, M.D.